Goddess of Wine: Wine with the LA Mission College Foundation 12th Annual Springfest! Wine with the LA Mission College Foundation 12th Annual Springfest! 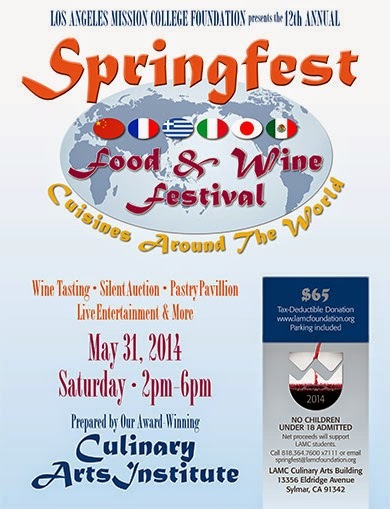 announced its 12th Annual Springfest Cuisines Around the World, a Food & Wine Festival Fundraiser, to be held Saturday, May 31 2014, from 2pm-6pm at their Culinary Arts Building. Led by Chef Jesse Sanchez, Culinary Instructor and Certified Executive Chef, the award winning Culinary Arts Institute will prepare internationally inspired dishes, and a decadent Pastry Pavilion filled with sumptuous confections. In addition to a food and wine experience, the Culinary Arts Building will be transformed into a decadent Mediterranean Holiday setting where guests can mingle with the festive, gregarious Romans. Guests will also enjoy live entertainment including the Latin Jazz of Tropical Brazilian Guitarist Jon Stephen with a special guest appearance by critically acclaimed Jazz Vocalist Lauren Koval. A Silent Auction will be conducted to raise funds for the Foundation. LA Mission College Culinary Arts Building is located at 13356 Eldridge Avenue, Sylmar, CA 91342. Guests can purchase an all-inclusive ticket for a $65 Tax Deductible Donation and must be 18 years of age or older. Join Springfest on Facebook and follow the Los Mission College Culinary Arts Institute on Twitter to keep up on the most recent news. The goal of the Los Angeles Mission College Foundation is to provide a local financial support system to deserving students entering and continuing their education at Mission College. The mission of Los Angeles Mission College Foundation is to raise funds and provide stewardship for funds already raised, through annual scholarship drives, special events, grant applications and business partnerships. The Foundation’s goal is to provide a local financial support system to underprivileged and deserving students entering and continuing their education at Mission College. The vision is to improve the quality of life in our community by providing support for individuals from diverse backgrounds to pursue quality accessible educational programs and services. The members are strong supporters of community-based education and believe that a community college education can open many doors and career opportunities for students. Los Angeles Mission College and its Foundation are committed to building a better community and preparing students for a life of service and leadership. Contact the Foundation at 13356 Eldridge Avenue, Sylmar, California 91342; (818) 364-7600 ext. 7111; info@lamcfoundation.org; visit http://www.lamission.edu/foundation. Join the LAMCF on Facebook.